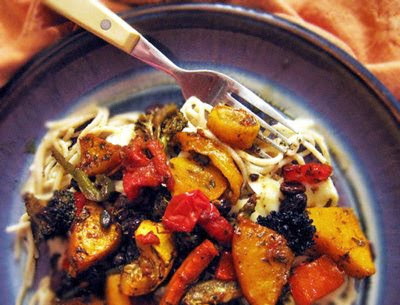 Roasted vegetables on brown rice pasta. The house is looking bare now but for boxes stacked in corners [scribbled with colored markers: art books, cook books, fiction, Jungian]. The movers will be here May 1st. We're moving only books, paintings, music, photos, and the boys' artwork/school projects. The next big thing is the estate sale. I’ve been piling all the odds and ends and books for sale in the downstairs studio. Clothes gathering in the spare closet wait for strange shoulders and hips - somber winter coats and velvet skirts and black designer dresses I will never wear again [not that I wear many dresses – I live in jeans; two dresses still sported TJ Maxx price tags from the fall of 2002.] We’re selling every stick of furniture. The more I shed the more I want to shed. Food has been simple, pure comfort food. Last night was Tinkyada brown rice pasta tossed in butter and olive oil and grated Parmesan, then smothered with balsamic roasted vegetables spiked with garlic and capers and charred just enough, so tender and sweet they melted on the tongue. The Pinot slid down easily. We held hands and conjured New Mexico and future margaritas. Kivas and nichos. Vigas and coyote fences. We imagined where we might be. What kind of space? A streamlined loft? A small casita? We are open to everything. I know, this is so much fun, Karina. I feel like I'm reliving our new start all over again by reading your posts. Hi! I got your message over at my blog and just wanted to stop over and say thank you so very much! I adore your blog! We are at the point where the empty nest is looming a few years down the pike (two high schoolers) -so I've enjoyed reading about your fresh start, your paring down -and your food of course! I love finding good GF recipes!